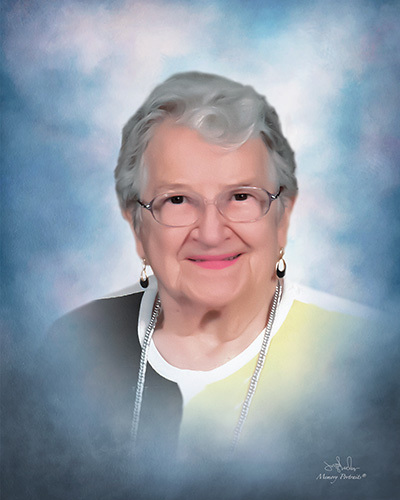 Grace Marie (Wilcox) Bowden, age 94, of Moon Township, passed away on Sunday, March 31, 2019 at Rochester Manor. She was born in McKeesport on February 6, 1925 to the late Clarence and Mary (Katona) Wilcox. In 1989, she was preceded in death by her beloved husband for 45 years, Clair Edward Bowden, and her son Kenneth Clair Bowden in 2017, a U.S. Marine Vietnam Veteran. She was also preceded in death by her sister Marilyn Wilcox Marvich. Loving mother of Linda Robson (Dennis Fedorko); mother-in-law of Alice (Taylor) Bowden; grandmother of Benita Robson (Robert Chase), Frank Robson (Jessica), Kimberly Johnson (Walt), and Kenneth Bowden Jr. (Charity Butler); great grandmother of Stephen Cable, Samantha Cable, Joseph Chase, and Lincoln Johnson. Grace was a member of Sharon Community Presbyterian Church, Ladies Auxiliary of VFW Post 402, Moon AARP, Moon Area Senior Center, and worked at the voting polls. Very welcoming, she always would give you a hug, enjoyed doing good for others, loved working on ceramics, crafts and crocheting- still participated in crafts at Rochester Manor. Visitation Wednesday 2-4, 6-8 and Thursday from 10 AM until time of service at 11 AM at Copeland’s Moon Township, 981 Brodhead Rd. Rev. Becky Branch-Trevathan Branch officiating. Burial will follow in Sewickley Cemetery. In lieu of flowers, family suggests donations in her name to Vietnam Veterans of America, National Headquarters, 8719 Colesville Rd., Suite 100, Silver Spring, MD 20910, www.vva.org.